Attorney Tsvetan Tsanev, to whose name the account at Investbank has been registered, the same account which has been used to funnel tens of millions of Petróleos de Venezuela, S.A., the Venezuelan state-owned oil and natural gas company (PDVSA), has had in the past close business relations with individuals from the so-called “Bankya Circle” over oil business with Russia. One of these individuals is Dimitar Sabev, whose relative Nedyalko Nedyalkov is a Deputy Head of Bulgaria’s National Security Agency (DANS) – the institution tasked with detecting cases of money laundering. According to an investigation by Bivol, a large shareholder in Investbank is also closely related to Tsvetan Tsanev’s family business. The first mention of Bulgaria as a transiting country for PDVSA’s cash came from Venezuelan MP Carlos Paparoni on February 9. The case, however, made the headlines only after the US Ambassador to Bulgaria Eric Rubin had a meeting with Prime Minister Boyko Borisov, Prosecutor General, Sotir Tsatsarov and the head of Bulgarian intelligence to inform them that the Venezuelan cash flow through a Bulgarian bank had been confirmed by the US financial intelligence. Tsatsarov, who spoke to the press after the meeting with the US Ambassador, didn’t name the bank and only mentioned the initials of the account holder as Ts. Ts.. Shortly after the news broke, Bivol revealed that the bank is Investbank and the account holder is lawyer Tsvetan Tsanev – a shady person who appeared in our previous investigations. Prime Minister Boyko Borisov first spoke about the “Bankya Circle” after Bivol revealed that in the 1990’s, during the transition period after the fall of Communism, Borisov had been tailed as a person of interest for his participation in criminal groups and had been later recruited by the Central Unit for Combatting Organized Crime as an undercover agent with the codename “Buddha”. Borisov then said that this somewhat fabled backstage group was behind the “Buddha” revelation. It includes former leaders of the Communist and early post-Communist state and senior officers from the Communist regime’s special services – the State Security (DS) known as the “Bulgarian KGB”. Borisov’s statement showed that he had been close to this circle, which brings together figures such as Victor Vulkov, a former Foreign Minister in the 1990’s (DS agent with the codename Pencho), Maxim Dimov – former lawmaker from the Movement for Rights and Freedoms (DPS), the party largely representing Bulgaria’s Muslim minority and later a treasurer of the National Movement for Stability and Prosperity (NDSV) of former Tsar and Prime Minister, Simeon Saxe-Coburg, Dimitar Sabev (DS agent with the codename Assen), General Dimo Krastinov, Ivan Sazdov – the head of the tennis club in Bankya, who “rose to fame” alongside the “House in Barcelona“, Evstati Gyurov (a former full-time DS officer), among others. General Chavdar Chernev, who in the early 1990s headed the Sofia Policed Directorate, is considered to have been their leader. He is also “credited” with arming the first thug brigades in Bulgaria. The name of the group comes from the “White House” restaurant in the Sofia suburb of Bankya where the gatherings had been held. Part of its members relocated later to restaurant “Monterey,” where a new group had been formed, led by former DS general, Lyuben Gotsev. He is credited with the founding of the so-called “Generals’ Movement” in the mid-1990s, which brought together most of the members of informal “generals’” circles such as “Bankya” and “Monterey”. In fact, these backstage groups have been consistently ruling the country throughout the Transition Period after the fall of the Communist regime, and all active political or economic players are their projects and puppets, according to data and analyses of informed intelligence sources. It is no secret that behind the “child prodigy” Delyan Peevski’s facade and his unexplainable rise to political and business stardom, lurks the long hand of high-ranking former DS officers. These individuals have had and some still have joint businesses through the companies “Interbulpred”, “Sofia Delta Ltd.”, “Rubin Tours” and “Elmaz 24”. Borisov also appears in “Interbulpred”, together with Rumen Gotsov “The Pasha” Nikolov, one of the bosses of the former Security Insurance Company (SIC), believed to have been a front for a large criminal organization in the 1990s. For the purpose of the current investigation, however, “Elmaz 24” is more interesting, as according to media reports, the now-Deputy Director of DANS, Nedyalko Nedyalkov (headline photo) had worked there. Nedyalkov has also appeared together with Maxim Dimov in the Managing Board of Football Club “Chernomoretz Balchik”, together with the current Minister of Sports Krassen Kralev and Atanas Vassilev Dobrev. In 2014, Nedyalko Nedyalkov was a candidate for the post of Director of DANS together with Vladimir Pisanchev and appeared for a hearing in Parliament, which is one of his rare public appearances. There were reports then that he was the nephew of an influential person but we never learned who this person was. Bivol’ investigation found that there are data about a family relation between Nedyalko Nedyalkov and the businessman from the “Bankya Circle”, Dimitar Sabev. Their families are from southern border town of Svilengrad, where Dimitar Sabev and Nedyalkov’s mother – Sofka Dimitrova – own a family home together. It is located on 13 “General Strukov” Street. This is also evident from the Property Register, where Nedyalkov had been registered together with his mother in 2014. In 2002, Dimitar Sabev had sold the second floor of the house to Nedyalko Nedyalkov’s sister Maria. Tsvetan Tsanev is not among the “Bankya Circle” members, but his business interests intersect with Dimitar Sabev and Maxim Dimov. They had been at different times managers of subsidiaries of the Russian Oil Company “Rusneftekhim“. Tzanev and Dimov had managed jointly “Rusneftekhim Balkans” and Dimov and Sabev – “RNK Petrol”, which is owned by “Rusneftekhim Bulgaria”. Maxim Dimov is still listed as a representative and member of the Board of Directors of “RNK Petrol”. “Rusneftekhim” is also closely associated with Atanas Dobrev (see above), who was a diplomat in Afghanistan and China, and Chief of Staff of former Finance Minister Milen Velchev. Dobrev’s business connections to the “Bankya Circle” are quite obvious. He was a shareholder in the investment brokerage company “Hedger” of Maxim Dimov and General Dimo Krastinov and a partner of Dimov in several other companies including “MakKap” and “Sofia Wind Park”. All of them, as well as “RNK Petrol”, are registered at the same address and share the same phone number – 958 25 77, but no one answers it. “Petro Alliance” has a representation in Bulgaria and has been the owner of the company TKM RAILWAY TRANSPORT AND SERVICES Ltd., associated with Tsvetan Tsanev and his sister Velichka. In 1998, the scandal with two Russian landing planes that have been staying at the Burgas airport for five years broke. Then a German “TKM” company appeared, claiming it wanted to buy them. Media publications from that time explain that Tzvetan Georgiev Tzanev is behind TKM, while Antje Milhahn is the manager. Years later, the Bulgarian “TKM”, representing the Swiss “Arvex” in Bulgaria, became involved in the bombastic affair with the delivery of 30 refurbished train cars for the Bulgarian State Railway company BDZ. As the Prosecutor’s Office says, the cost of the cars had been inflated more than 20 times, and some had not been delivered. The Swiss Prosecutor’s Office has also launched an investigation into “Arvex”, which outcome remains unknown. Meanwhile “Arvex” has been liquidated. Then again, familiar faces emerge in its ownership. 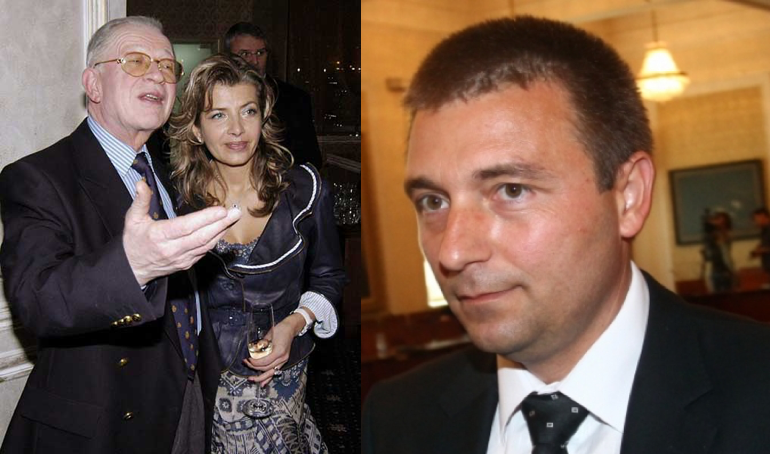 Tsanev’s wife Antje Milhahn is the owner and currently, the liquidator of “Arvex” in Switzerland. On its part, the company in Bulgaria with the same name is managed by Andrey Georgiev and Kostadin Anakiev. In 2018, the latter will appear as manager of Bulgargeomin Ltd, which at the end of last year hijacked the Libyan tanker BADR and caused an unpleasant for Bulgaria international scandal that is still brewing. The companies behind Bulgargeomin Ltd are also closely connected not only with Tsanev, but with Investbank as well. It is an important fact that Dimitriika Lazarova is the proxy of Petro Alliance in Bulgaria. She is connected with the Tsanev family through other companies as well. In 2013, Dimitriika has managed the company “Geobul Metal”, whose main shareholder is Antje Milhahn. The same Dimitriika Lazarova is also a member of the Supervisory Board of Investbank, representing the interests of the Omani shareholder Sheikh Adel Said al-Shanfari, who in 2012 saved the Bank, owned by Petya Slavova, by joining its capital with BGN 50 million. His elder brother Thamer al-Shanfari was on the United States’ “black list” because of his ties to the Zimbabwean dictator Mugabe, but has been subsequently removed from it. Adel Said al-Shanfari is married to a Bulgarian woman – Denitsa Mihaylova, who works at the Ministry of Foreign Affairs. Mihaylova and her Sheikh made headlines for beating popular singer Ruth Koleva, who had pointed to them that they had parked their vehicle illegally. But that is not all. The incorporated in Switzerland company “Shanfari” SA, (formerly Tectona Trade) is also represented by Lazarova in Bulgaria, where Shanfari has been the owner of Tectona AD. Tectona is a co-founder of Bulgargeomin Ltd, the company claiming the ownership of the Libyan tanker BADR. The former manager of “Shanfari” SA is Andrea Caravelli, who, together with Tsvetan Tsanev, was part of a group of “European investors”, negotiating with the Cosa Nostra boss Antonino Messicati Vitale to acquire a stake in a diamond concession in South Africa, as revealed by an investigation by Bivol from 2015, when Bivol, together with the Organized Crime and Corruption Reporting Project (OCCRP), of which our media is a partner, participated in a large-scale international investigation by IRPI/ANCIR into the diamond business of the Italian Mafia in South Africa and Zimbabwe. Sheikh Adil Said al-Shanfari, himself, is the owner of the company “Nura Bulgaria”, where Assen Kavdansky is the manager. Kavdansky does not have his own business, but he is the manager of several companies associated with the Tsanev family. He is the person who has appeared as a representative of Bulgargeomin before Greek notary Ioanna Andreadaki to prepare a maritime mortgage on the tanker BADR, which, according to the notary, has been subsequently falsified. Is Investbank involved in the “Venezuelan Laundromat”? On February 14, Investbank distributed a statement to the media in which it categorically denied that it had been involved in illegal operations with money transfers from Venezuela. The Bank claims that all transfers have passed through third banks and have been screened according to international anti-money laundering rules. The statement of Prosecutor General Sotir Tsatsarov was also along these lines as he said that the Bank had not been aware of what had been going on. However, with all these connections, it is quite obvious that there is no way Investbank had not known about Tsanev’s account and the significant for local standards amounts that had transited through it. After all, one of the Bank’s main shareholders, al-Shanfari, is undoubtedly linked to the business of lawyer Tsvetan Tsanev through Assen Kavdansky and Dimitriika Lazarova. Furthermore, it is worth recalling that the genesis of Investbank is closely related to the circle around General Lyuben Gotsev, who joined the Supervisory Board of the International Orthodox Bank of St. Nicholas before it was renamed to Neftinvestbank and finally to Investbank. Furthermore, Investbank is described by former US Ambassador to Bulgaria John Beyrle in a classified diplomatic cable from 2006 that leaked to WikiLeaks as one of the “bad apples” Bulgarian banks “whose practices are repeatedly cited as questionable or shady, funneling money for known criminals in money laundering schemes and involved in connected lending”. All of the above raises many questions and the first one is how is it possible that a Deputy Director of DANS has family and business relations with the Russian oil business, with which Tsvetan Tsanev is also closely associated? According to the requirements of the newly adopted by Parliament Act on Measures for Preventing Money Laundering and its Rules of Procedure, each Bulgarian bank is mandated to train its employees in due time and to provide information to the Financial Intelligence Unit of DANS on any financial operation that causes even the slightest suspicion of money laundering, and especially on those from abroad and especially on those from risky areas, such as Latin America. What is the reason why the DANS totally missed the existence of the “Venezuelan Laundromat” at Investbank? Why had the DANS and Prosecutor Sotir Tsatsarov waited for the US authorities’ signal to undertake some actions? Why did Tsatsarov lie on live TV that the Bank had nothing to do with the funneling of Venezuelan money and had not known what had been going on? Why is the name of lawyer Tsvetan Tsanev remaining a taboo for all institutions? Bivol sent questions to the DANS via e-mail. We asked about Nedyalko Nedyalkov’s exact kinship with Dimitar Sabev and whether Nedyalkov had worked in companies controlled by Sabev or Maxim Dimov. We also asked whether the DANS leadership has deliberated whether these family and business ties of Nedyalkov could influence the work of the Agency on the prevention and interception of money laundering. We did not receive an answer. However, there is also no answer to the questions sent to Investbank. We were unable to contact Tsvetan Tsanev at the available e-mail addresses and phone numbers of the companies in which he participates. Of course, their right of reply is standing. The reason for such discretion is probably the remarcable list of Tsanev’s merits – from captagone trafficker, through train cars and airplanes affairs, a partnership with a boss of Cosa Nostra in a bloody diamond business, to the very recent pirate raid against the tanker BADR and his role in the “Venezuelan Laundromat” – an impressive biography associated with the DS and the backstage rule. Nevertheless, perhaps the most important goal is to keep secret the connection between Tsvetan Tsanev, Russian oil and individuals from the “Bankya Circle”. This, however, can no longer be ignored. The first checks that we made into the Russian owners, together with colleagues of renowned international publications, reveal even more alarming facts about which you will read in the next part of our investigation.